The Latino pop star blasted Trump for making "racist, absurd, incoherent, and ignorant" comments about Latinos. 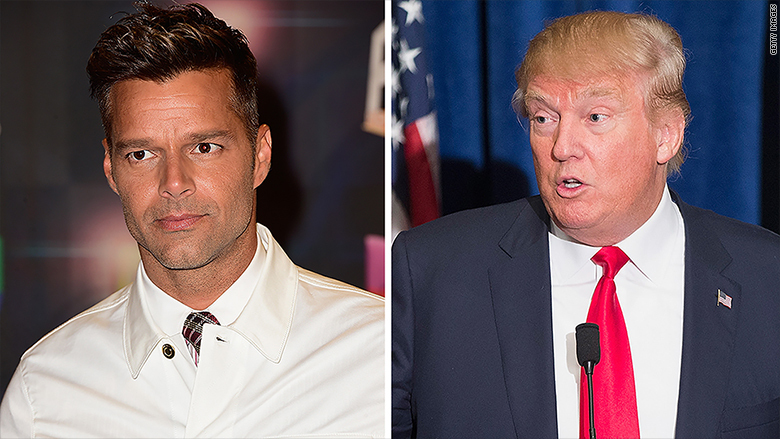 Ricky Martin is not a fan of Donald Trump. The Latin pop star criticized Trump in an op-ed for Univision News, saying the fact that Trump "has the guts to continue to gratuitously harass the Latino community makes my blood boil." In the editorial published Wednesday, Martin also blasted Trump for making "racist, absurd, incoherent, and ignorant" comments about Latinos. "From the outset his intention was clear: Say barbarous things and tell lies in order to stay relevant in the public eye and either gain votes or stay in the media," Martin said. The op-ed came a day after Trump kicked Mexican-American journalist Jorge Ramos out of a press conference for asking a question out of turn. Trump told Ramos to "go back to Univision" as he was being escorted out of the presser. Martin defended Ramos, saying he was just trying to do his job. "The incident against journalist Jorge Ramos, one of the most beloved and respected Latinos, went too far," Martin said. "Trump's actions don't surprise me," Martin continued. "What surprises me is that as Hispanics we continue to accept the aggressions and accusations of individuals like him who attack our dignity. Enough is enough!" Martin then urged Latinos to stop accepting this degrading treatment and to stop allowing Trump to pretend he has power over Latinos. "Xenophobia as a political strategy is the lowest level you can sink to in search of power," Martin wrote. "This is an issue that unites us and we need to fight together, not only for ourselves but for the evolution of humanity and those who come later."